Home > News > Mulled Tea To Create Sparks This Autumn. Mulled Tea To Create Sparks This Autumn. Stay cosy this Bonfire Night as you sip mulled tea. Create flavour fireworks and give your guests an evening to remember; in no time at all you can whip up a punch to make your evening go with a bang. Heat your Percy’s tea, cinnamon stick, star anise and ginger in a large pan for a few minutes, then add the orange zest. Simmer and then keep on a rolling boil for 5 minutes to allow the flavours to infuse and fill your room with a wonderfully autumnal aroma. 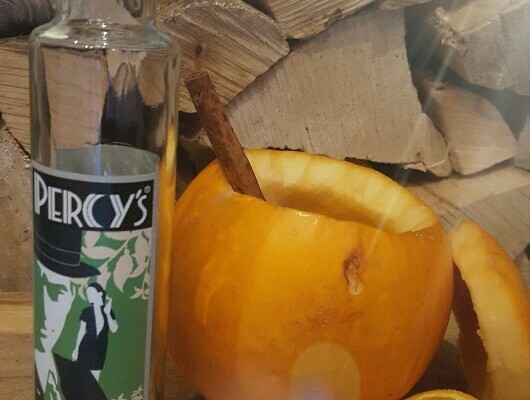 Ladle your punch into pumpkins and add a cinnamon stick stirrer. For extra pizzazz, pop in an orange slice and star anise. *For a stronger tea flavour, and to subtly personalise your brew, add a teabag of your choice – the spice mix won’t allow it to be overbearing.